Two laser-sharp detectives, two thought-provoking cases and two skilful plots. Featuring private investigator Johnny (One Eye) Hawke, and his one-time colleague in the police force Detective David Llewellyn. Llewellyn is investigating the chilling crimes of a top psychiatrist and his scheming patient who the doctor believes has knuckled under his authority. In the meantime, Hawke is on the case of a mysterious suicide in Edgware Road...soon discovered as not your average suicide. The guts and insight of the two investigators bring both cases to a head - though you won't even begin to see how until you have turned the last pages. By the Sherlock Holmes expert David Stuart Davies. Start reading A Taste for Blood on your Kindle in under a minute. David Stuart Davies is the author of five novels featuring private detective hero, Johnny Hawke, and another five novels featuring Sherlock Holmes as well as several non-fiction books about the Baker Street detective including the movie volume Starring Sherlock Holmes. As well as being a committee member of the Crime Writers' Association, and editing their monthly magazine, Red Herrings, David is the general contributing editor for Wordsworth Editions Mystery & Supernatural series and a major contributor of introductions to the Collectors' Library classic editions. Really a junior adult adventure book but though somewhat shallow in content, nevertheless an entertaining read, as indeed are all of his other Johnny Hawke novels. 3.0 out of 5 starsA good mystery but won't leave you wanting more. This is one of the oldest books in my ARC queue and was requested at a time when I was requesting everything in the hopes that I'd be approved for <em>some</em>thing. I did not know that it was a part of a longer series. But all that aside, I don't think you need to read the previous five books in the Johnny One-Eye Detective series to appreciate the story ... though you might want to after reading this. Johnny "One-Eye" Hawke is a private investigator and is currently looking in to a suicide that just doesn't feel right. A police detective friend of his, David Llewellyn, is investigating a bloody crime involving an escaped convict and a psychiatrist. These appear to be separate, parallel stories until Hawke manages to come to a realization about his friend. The cases do teases us as coming together once in a while, but author Davies manages to keep us on our toes. The book is set during WWII era and I'm not quite sure why. I tend to like historical fiction, but nothing about the era mattered to the story. In fact I found it a bit of distraction because it read pretty modern and then something would pop up from the era and I'd be thrown off for a moment. The book is well-written and the mystery is very intriguing. The last few chapters had me on the edge of my seat. They were also somewhat gruesome in expectation of a nasty killing. On the one hand, this is very much the sort of hard mystery you might want to read (if you enjoy mysteries with a bite). It's well-written, with interesting characters, and a plot that keeps you paying attention. On the other hand, there is nothing really very spectacular here. It's a good story but not one that I will look back on and want to read again. It is what I consider beach fare or an airplane read ... something to keep me occupied and entertained (I find reading to be entertaining) and not much more. In that sense, then, this is a perfectly average read. Looking for a good book? <em>A Taste for Blood</em> by David Stuart Davies is a good hard mystery that won't leave you longing for more but will entertain fans of the genre. 4.0 out of 5 starsEnjoyable British Crime! 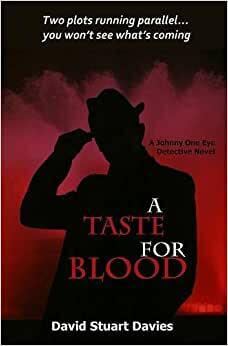 "A Taste for Blood" is set in 1940s London, during World War Two, and features two characters that fans of the author will have met before - Detective Inspector David Llewellyn of the Metropolitan Police and Private Detective, Johnny Hawke. As this is the first time I had encountered any novels by David Stuart Davies, I had no knowledge of these two characters. However, this did not affect my enjoyment of this crime novel. There are two storylines to the book, one in which we meet a particularly horrible villain who had previously been caught by D.I.Llewllyn and incarcerated for eight years before his escape. He is a ghoulish character, who is determined to imprint himself on the world in a very unpleasant manner. The other storyline concerns Johnny Hawke's investigation of a suspicious suicide. Both cases touch each other at intervals throughout the book, as David Llewellyn and Johnny Hawke are friends - this friendship plays an important part in the last part of book. I enjoyed "A Taste for Blood". It was rather gruesome in parts, but the violence was not gratuitous. I particularly liked the way in which the author used words and phrases which resonated with me. They reminded me of films and novels written in the 40s and 50s, giving the novel an authentic period feel. I had no idea how these intertwined plots would resolve themselves and was kept guessing until the end. I shall certainly search out some more of David Stuart Davies, starting, I think, with the first book featuring Johnny Hawke.